What can we learn from the hype around IWBs that dominated things? I’ve written a few times here about my reservations about interactive whiteboards, and I think that penny has well and truly dropped. At a recent discussion around the new technologies we might put in place, the only objections to NOT going with whiteboards in the future came from some primary teachers and a Science teacher who liked the way he could manipulate and show things using little apps with the board. For the record my reservations around IWBs have been that they retain the control of the ‘means of production’ with the teacher. They’re teacher-centric devices, they’re ‘look at me’ devices, they’re top-down cinema style devices. The teacher showing, while the audience watches on, rapt. That’s it. And, I think that, while the article I’ve linked to below has some of the wrong reasons for the demise in IWBs, there’s growing agreement that, like the Roman Empire, they’re past their best. 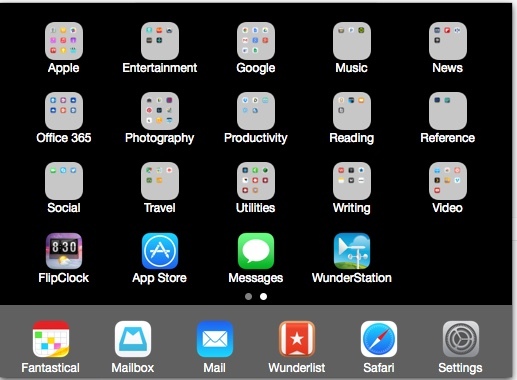 Inspired by several lists of apps I’ve seen lately, like this one by Alex Brooks from World of Apple, I thought I’d share my own top apps for 2014. I use an iPhone and a couple of iPads daily, along with my iMac, Mac Mini and Le Novo Yoga, my work laptop, but for this list I’m sticking to the iOS apps and not differentiating between the iPhone and the iPad. The best indication of how important an app is for me is where I store it. My most used apps are on the home screen and page 2 is all folders. My most used, most used apps are on docked at the bottom of the home screen. So, here goes. My favourite calendar app, esp. as it works so well with Outlook, which is what I use at work, so that is my primary calendar. When I was on leave this year I went back to Google Calendar for a while, and at that time I used the Sunrise calendar app, which is also nice. But Fantastical looks great and has rep,aced Agenda as my default calendar app. I use gmail for my personal email and, while their new Inbox is pretty good, Mailbox makes it super easy to process emails and move them into action, waiting for, archive or just trash. I can process my email really quickly and its replaced Airmail on my Mac as well. Okay, the standard email app, which I use to look at the Outlook email from work. Nothing fancy, but it works. I paid big $$ for Things on the IPad, iPhone and Mac, but gee it was slow to update for iOS 7 and it never had a Windows version at all. So, I was using it for home tasks and Outlook tasks for work tasks, and splitting into separate systems isn’t wise (I read the Getting Things Done book a few years ago and it changed the way I work). Wu der list is free, works on anything and,while not quite as full featured as Things, works really well. I use Chrome pretty much everywhere but on iOS Safari just seems better and smoother. Not really an app, but I’m fiddling around with settings so much that I keep it in the dock. My favourite writing app on IOS, mainly because it syncs so nicely with Ulysses on the Mac. I use it for writing on the go, for poetry mainly. 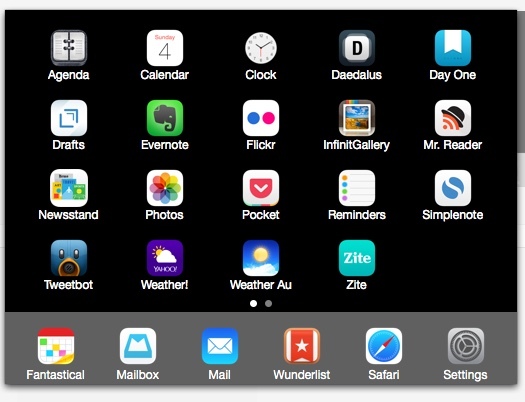 Apparently, a full-blown IOS version of Ulysses is in the works for 2015. My favourite diary/journalling app. It adds weather, location, and you can add a photo (or use HTML to embed) It can publish to a web page, but I use it for my own private use. I even got my old MS Word journal out from years ago and added those entries to the appropriate dates. My second favourite writing app, especially for quick notes that are going to end up somewhere else. You open it and you get a blank screen to type on and it has an enormous range of export options. My photo app of choice. Flickr has improved a lot in the last 12 months and the new (long-awaited) IOS apps look great. Since Instagram still hasn’t got an iPad app, I use InfinitGallery to look at Instagram on the iPad and the original app on the iPhone. Video killed the radio star, and Twitter has just about killed off RSS, but if you just want to get an update whenever a webpage or blog is updated, then RSS is great. I was worried when Google Reader died, but Feedly has done a great job of taking up that feed aggregation thing and Mr Reeder provides a nicer interface for reading them. I read The Age on the iPad in Newstand. Any web page, or article of interest that I want to read later, I sent to Pocket. They look great, and are available offline, so when you get on that plane trip your own interesting little magazine is there and ready to go. Replaced Delicious for me a couple of years ago now. I’m a long time fan of this simple note taking syncing thing. It’s the ‘works on all platforms’ thing that always sways me. My favourite way to read Twitter. Visually very nice. I put in places I want to go and travel to, like Kyoto and nice pictures come up. Not sure how long this will last since Flipboard bought it (I think) but still works really well to find articles you’re interested in. Better than Flipboard, which is based on the provider or publisher model, this reverses that model and goes out and looks for the interests you’ve specified. 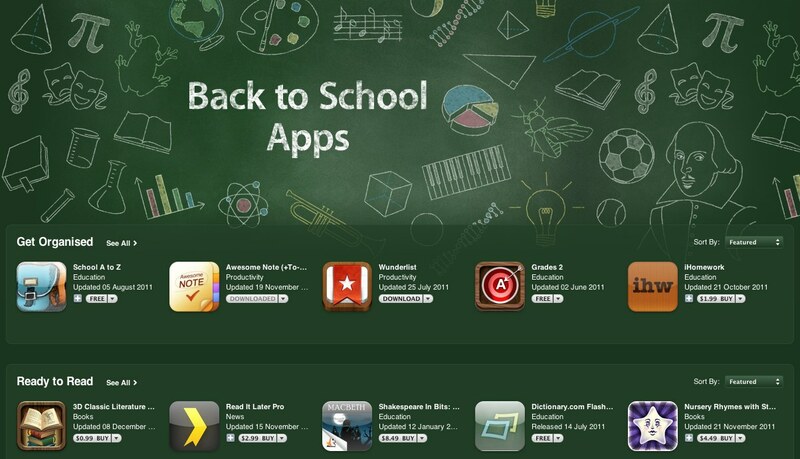 All the standard Apple apps, most of which I don’t use. Highlights here are TuneinRadio and some TV catchup apps. TuneinRadio has added silly features like the need to create an account,but it’s still the best radio app I know. Chrome, Docs, Drive, Gmail, Google+, Sheets, all work well. All somehow unlovely too! My Cleartune guitar tuner, Pandora and Spotify. Could this be the year I get into subscription music? Microsoft has been late to the party but they’re keen now. I’ve talked a lot about how much I like OneNote but I’ve got OneDrive, OneDrive for Business, PowerPoint and Word here too, as well as Lync for messaging within the work environment. The highlights here are Lightroom, which syncs well with the desktop model (I’ve bough the annual subscription to that and Photoshop) and VSCO Cam, still the coolest photo filters of all. GoodReads for sharing my reading and the Kindle app of course. 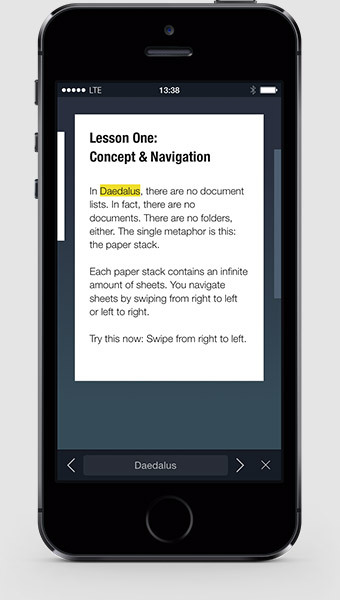 Okay, I’m a sucker for writing apps like 1Writer, Byword, Editorial and iA Writer, but I keep coming back to Daedalus. YouTube and Vimeo of course, abut also StreamToMe for streaming video in a range of formats to the iPad or IPhone, and Plex, which I use to stream movies to the Apple TV. Finally, I’ve started using WunderStation for its great local weather options, which are crowd-sourced from thousands of private weather stations around the world. There’s one just down the road from me and I really appreciate being able to see the real local weather. It will be interesting to see how different these look by the end of 2015. Late late year, I poste on The Tools I Use, about the tools I use on the desktop. Maybe I should alternate between the PC and IOS year by year. Let me know if there’s something great that I’ve missed. 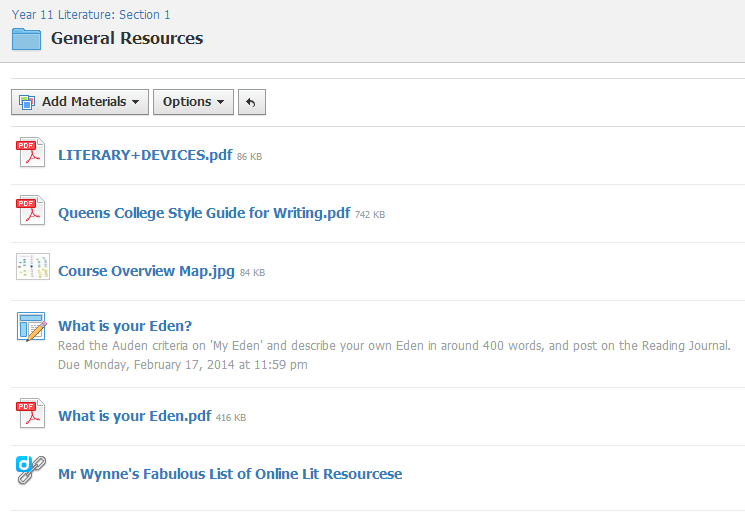 So, it’s one week into using Schoology and pretty impressed so far. It has all the essentials you’d want to see in an LMS including flexible resources and management, assignments, discussion forums, file submission, even badges. I’d like to see a better looking update system that’s not so teacher-centric, like when a student posts a discussion post or not so m manual. Students shouldn’t have to dig down through the folder list to see if there’s something new, and I shouldn’t have to manually tell them either. This is how the resources are organised; there’s folders that can contain a range of resources. In this folder there’s some PDFs, a JPG and a homework assignment. Assignments get reminders on the front and I get an email when a student has submitted some work. Early days but the rubric section looks pretty powerful. 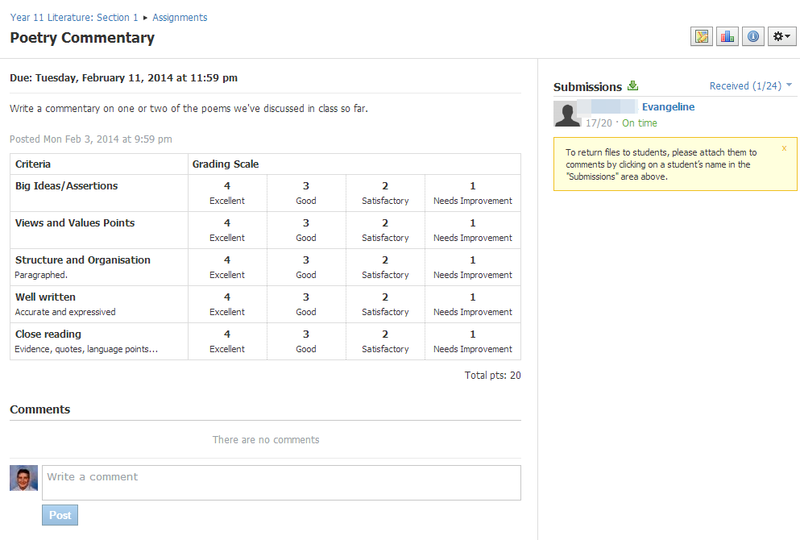 I set up a homework assignment with four criteria and a simple rubric and you can see here that one student has already submitted it. It was easy to mark, but the in-house editing and annotating tools were pretty clunky. It wouldn’t highlight where I pointed, and a comment spread over the whole document . In the end I chose the option of downloading the file, annotating in in Word, saving it, then uploading it again. A bit of a disappointment as far as work-flow goes. Also, I haven’t found yet whether I’m able to just tick that something has been submitted (like a bit of homework) without assigning a grade. It wants a number of letter. I’ve tinkered around with a simple rubric that says Done/Not Done, but even that wants to assign some points or grades. In the end, whether Schoology works will be in the workflow for me and my students. It’s got to be better than email, or a shared Dropbox folder. So far, it’s promising, but the fact that new resources don’t automatically create an update, and that the in-house annotating tools are so bad, it might not last for me or my students as a tool beyond our initial semester trial. I blogged about the forthcoming Oxford Conference in Sydney a while ago, but not it’s well and truly coming up and I’ve been thinking more about what to say, and how to get the message across. 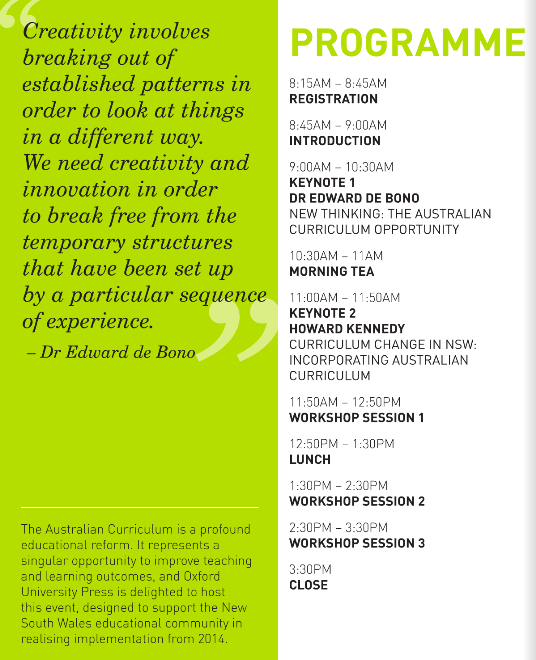 The key idea is to respond to the Australian Curriculum in English in new and innovative ways. New responses for a new curriculum, that kind of thing. So, I thought I’d start with an overview of English (real quick) and a link to some of the online curriculum and curriculum resources available, then delve into what teaching (should?) looks like now, and then in to more detail about the kind of (flipped classroom) tools and tips and techniques that might help make that happen. Then, finish with a bit about building your own personal professional learning network online and not relying on school-based old style PD, with an emphasis on Twitter and all that. I’ve been trying to be more actively interventionist in my Literature teaching this year, inspired by some thinking about Personalised Learning I’ve been moved to consciously work on some ‘high impact micro-teaching strategies’ that might help student learning as a follow up to some thinking on formative assessment over the past couple of years. So, I’ve kept the things that have been working pretty well (the wikis, using OneNote as the default teaching, presenting and note-taking tool) and the blog as the primary means of communicating class news and information. But I’ve also tried some new things too. I’ve also been up front with the students about that, talking them through my thinking and what the intention/s are. They’re Year 12 students after all, 17 or 18 old most of them, well able to understand these approaches and generally just as keen to do well as I am for them to do well. We began with a ‘no-hands’ up approach to discussions and I showed them a couple of bits of research about that, including this piece from the BBC. This approach, coupled with greatly increased ‘wait-time’ has seemed to make the class more generally attentive and receptive. I haven’t had a problem getting discussion going with this group; they’re great about that, but the ‘no hands up’ means that everyone is involved potentially. I also moved the room around a bit, based on some feedback I got from a couple of teachers who sat in one of my lessons for a ‘classroom observation’ project we’re trialling. I’m stuck with little individual ‘test-style’ tables and, yes I could bundle them into ungainly little squarish pods each lesson, but the next teacher would probably untangle all that and start again. So, I’ve tried a kind of horseshoe arrangement that I use for lots of meetings I run, where students can really make good eye-contact with each other in all the conversations. They’re still all facing the front where the data projector (and teacher) is, but it’s generally more conducive to a good collaborative atmosphere and, importantly, the other teachers who use the room, can mostly tolerate it and don’t shift things back. I’m going to do more surveys too, shorter surveys more regularly. I generally do an end of semester student survey and end of year but, inspired by a young English teacher who’s been giving her students short surveys using Google Docs (I don’t even know how to do that) I plan to do more surveys online using our own school system. I did the first survey this week and already it’s given me some good feedback that I intend on acting upon right now, rather than wait until the end of the semester. This is all about helping students improve as they go. 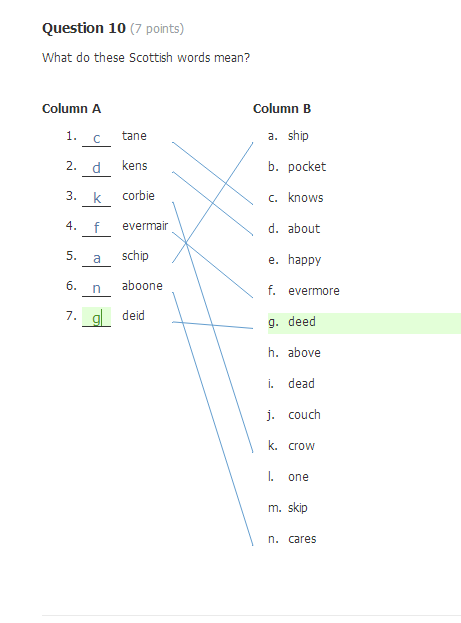 I found that they haven’t much enjoyed the poetry cartoon tasks I’ve been setting, which is interesting as I wouldn’t have picked that. I liked them! And they’re sometimes not so sure about how well they’re going, the kind of progress they’re making. So I want to work on more individual feedback more often, short, focused learning conversations perhaps. I was also inspired by another teacher to try the “Icy pole sticks”. 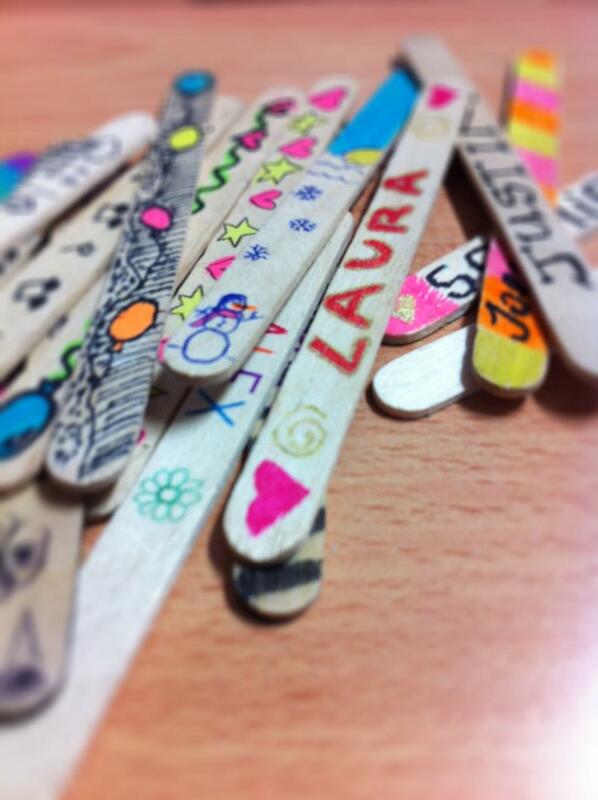 A simple technique, that you’d often do with younger students, of having an icy pole stick for each student, with their name on it, and selecting the stick at random and asking that student to answer the question. A kind of simple randomiser, and you can just keep selecting sticks at random, or move them from the big pile to a ‘used’ pile to ensure that questions are distributed around the room. I told my class about the idea and got them to name and decorate their stick with some iconographic aspect of themselves. Which was fun. So, the icy pole sticks, combined with wait time, and the ‘no hands up’, has helped reshape some of the questioning that goes on in the classes so often. And helped make me more conscious of this approach even though, every now and then, I’m drawn to ask the keen student who I know is itching to say something. I’ve just started to try to collect some of these techniques on a Diigo list HERE. Suggestions are welcome, particularly focused on assessment for learning strategies. Finally, some traditions are too good to change. Cake day, once every fortnight at the end of the day, is a student-inspired initiative that I’m happy to continue just as it is.